Mr. Joseph Philippe Lemercier Laroche (R), with his wife Juliette Lafargue and their two daughters, Simone and Louise. The fictionalized story of poor vagabond Jack Dawson (Leonardo DiCaprio) and 17-year-old aristocrat Rose DeWitt Bukater (Kate Winslet) falling in love on the Titanic won James Cameron a Golden Globe for Best Director. The film also won Best Motion Picture, Best Original Score, and Best Original Song. Titanic was also nominated for 14 Academy Awards, winning 11. The original film and the 3D version released on April 4, 2012 to commemorate the 100 year anniversary of RMS Titanic sinking, grossed over $2 billion globally. That is the 2nd highest total ever for a film, second only to Cameron’s other blockbuster, Avatar. As cute and addicting as Cameron’s version of Titanic is, the true story is far more compelling and real. An interracial couple was completely eliminated from the script. They were historically significant, equally romantic, and coincidentally or otherwise, had a very similar fate as Leo and Kate on the boat! Who Is Joseph Philippe Lemercier Laroche? Mr. Laroche was born to an affluent family in Cap-Haïtien, Haiti on May 26, 1886. 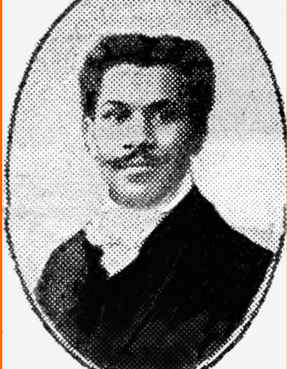 His uncle Cincinnatus Leconte was the President of Haiti for one year (1911-12). Laroche was sent to Beauvais, France in 1901 by his parents when he was 14. France is of course Haiti’s former imperial occupier. He studied engineering while in France, according to the Titanic Historical Society. Laroche ultimately earned his degree, but not before meeting the love of his life: a white French woman named Juliette Lafargue. The couple married in March of 1909 and had their first daughter, Simone, shortly thereafter. The couple’s second daughter, Louise, was born prematurely and had several medical issues as a result. Joseph tried to find work in France as an engineer after graduation. But because of his skin color, he was denied any real opportunities. The couple was forced to live off Juliette’s father, who owned a wine cellar. Medical bills for Louise were piling up and Joseph’s pride as a man was being tested. He decided it’d be best for the family to relocate back to Haiti where he’d be able to find real employment to support his family. All the while, Juliette became pregnant with their third child. Joseph’s mother bought the couple a ticket to Haiti on the ship Lafrance, but they later learned that black people were not allowed on board. 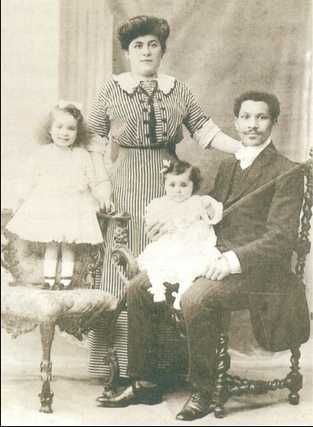 The family, desperate to get to Haiti before Juliette’s pregnancy was too advanced for them to travel, took a train to Cherbourg, France, and boarded the Titanic instead on April 10, 1912 with a second-class transfer. Christine LeBrun, a distant cousin of Laroche, told the Chicago Tribune that the family endured numerous racial taunts while aboard Titanic. Joseph was the only black man on the ship, and drunkards hurled insults at his daughters insinuating they were Japanese or Italian because they had never seen interracial human beings. When the ship struck the iceberg on April 14, 1912, Joseph was hanging out in a parlor socializing with other men. He ran back to his panicked wife and children to try and calm them down. Juliette spoke no English, while Joseph was fluent in both English and French, so he was charged with figuring out how to save his wife and children. Joseph reportedly placed all the family’s valuables in a coat pocket and put it on Juliette. He managed to get his wife and daughters on a life boat before it was too late. Joseph died when the ship went down. But his family survived because he sacrificed his own life for their well-being. 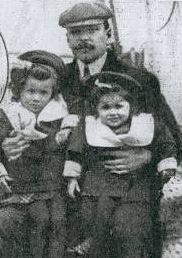 Juliette returned to France with their two daughters after the ship went down. She gave birth to Joseph Jr. a few months later. The family lived in extreme poverty as Juliette’s father lost his wine cellar during World War I. She was ultimately rewarded a settlement as a result of the Titanic sinking and began to piece her life back together. But Juliette and the girls never seemed to recover from the loss of Joseph and the trauma of witnessing Titanic sinking. Juliette never remarried and neither of the daughters ever married. Joseph Jr., however, did marry and have children of his own. Louise, the daughter born with all the medical problems, lived to be 88-years-old and was one of the few remaining survivors of Titanic upon her death in 1998. Many descendants of Laroche have been working for years to get a movie made that depicts the real romance that happened on the Titanic with their beloved ancestors. Its clear James Cameron and many other directors who have made films and television series about Titanic have deliberately ignored this historic couple. Sony, in hacked emails, said it did not want to cast Denzel Washington in blockbuster films because black lead actors “don’t play well” to international audiences. The passionate, genuine love story about an interracial couple in Cameron’s Titanic would have been historically accurate, but likely not as profitable at the box office. Hollywood and the world in general would rather bury the story of Laroche and Lafargue forever. But their descendants and others who recognize the sheer beauty in it will never allow that to happen. I love this couple, their lives tell a beautiful, captivating story. They should be memorialized, I hope some day I’m able to learn more about them.